Don't miss this live recording of Kathleen Nelson's Inspire conference. 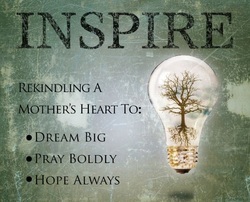 "Inspire" challenges Christian mothers to dream big, pray boldly, and hope always. This is not the same as the "Motherhood Conference" where Kathleen shares on the practical aspects of raising children. Sessions included are from her conferences in Greeley, CO in April 2013, and Eau Claire, WI in May 2013. Over 5 1/2 hours of audio! Inspiration is a forgotten idea in today’s Christian parenting. The idea that our children can be spiritual warriors no longer exists in America. Our desires, hopes, and dreams for our kids are merely shadows of their potential. We are not called to raise the next generation of halfhearted Christians who quietly live out their faith with no real influence or fervor. Instead, we are called to raise up an army of spiritual warriors. We mothers are called to inspire our children to spend their lives engaged in the spiritual realms, defending the glory of the Lord their God.